The View function allows you to concentrate on different aspects of diagrams by hiding or showing selected object or relationship types. The menu selection View | Selected... opens a selection dialog, as in Figure 4–19, allowing you to choose the object and relationship types to be shown. To select object or relationship types to be viewed mark them with a tick ‘✓’. 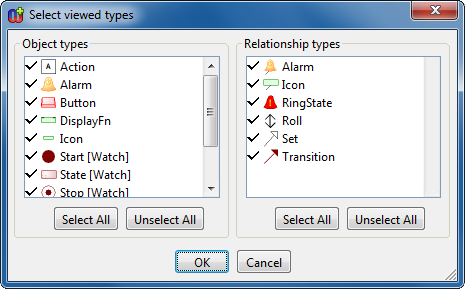 For example, according to the selection dialog below all components of the WatchApplication diagram are shown. Figure 4–19. A dialog for selecting object and relationship types to be shown. Relationships involving hidden objects are only shown if they also involve at least one object that is not hidden. Figure 4–20 shows the result of hiding State objects in a Watch Application Diagram. Note that this example is intended to highlight how the hide functionality works: more sensible choices of objects to hide here would be the black Action and Variable objects. Figure 4–20. An example of hiding objects. Similarly, View | All shows every object and relationship of a diagram. Hence, this command automatically selects every object and relationship type in the selection dialog (Figure 4–19). Deselecting an abstract type will also hide all instances of its subtypes. Figure 4–21. Selecting the zoom level. 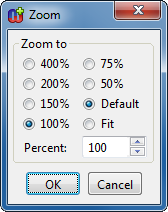 2) Select a predefined zoom level, default or fit zoom or set the zoom level into the Percent field. Alternatively, you can select a predefined zoom factor, fit or default zoom from the zoom pull-down list located at the lower-right corner of the Diagram Editor window. You can also enter a new zoom value if needed. Pressing the + and – buttons on the either side of the pull-down list will increase or decrease the zoom factor by one unit. Default and fit zoom can be also set by pressing the respective toolbar buttons. 1) Select the Zoom tool from the toolbar (a magnifier glass cursor will be shown when the zoom tool is active). 2) Move the cursor on the drawing area, press and hold down the left mouse button and drag the mouse over the area you want to zoom to. During the area zoom, hold down the Ctrl-key to zoom out instead of zooming in. The zoom out factor will be calculated as the relation between the selected area and the whole drawing area. You can also zoom in and out directly in the drawing area by holding down Alt and using the mouse scroll wheel. The current zoom level is shown in the status bar at the bottom of the Diagram Editor. 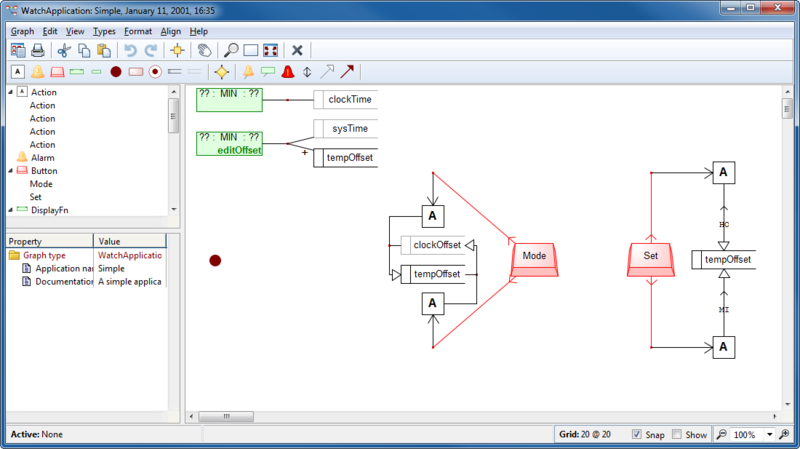 In addition to the usual scroll bars to position the editor view, the Diagram Editor also provides a Scroll Tool for more arbitrary scrolling of the editor view. To enable the Scroll Tool press the hand-shaped Scroll button in the toolbar. When the Scroll Tool is on, the normal mouse cursor will be replaced by the hand cursor. To scroll the editor view, press down the left mouse button and move the cursor around freely – the editor view will follow the cursor, as if you were dragging the diagram around on a piece of paper. To turn the Scroll Tool off, simply click right mouse button or deselect it from the toolbar. To help make your diagrams look neater, MetaEdit+ can show a grid over the diagram, to help you align objects with it. The size of the grid is controlled through the View | Choose Grid... dialog. The command View | Show Grid or toggling the Show checkbox on the status bar at the bottom of the window allows you to show or hide the grid in the diagram. Merely showing the grid does not affect object placement. You can force the use of the grid when elements are created or moved by selecting View | Snap to Grid or checking the Snap checkbox at the bottom of the window. The default target point of individual elements and role break points will be aligned to the grid in all operations. If multiple elements are selected and moved, they will maintain their relative positions to each other, and the whole area will maintain its relative offset to the grid. Thus elements that were previously aligned with the grid will still be aligned after the move. As with zooming you can also access the grid setting through a pop-up menu by pressing the right mouse button when nothing is selected in the diagram. The command Align | Align to Grid aligns the selected object and relationship default target points and role break points according to the selected grid. If there is no selection, all elements are affected. Align to Grid is also available as a button in the toolbar. The other commands on the Align menu expect a multiple selection. They take the first selected element as their base and align the other selected elements to it. 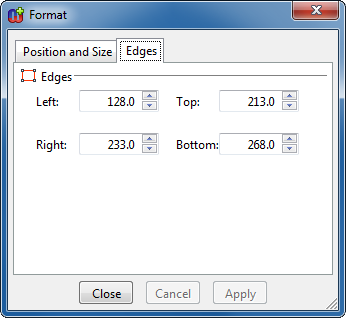 For instance, Align | Align Left will move the other selected elements horizontally so that their left edge is aligned vertically with the left edge of the first selected element. Align Target X and Align Target Y work on the basis of the default target point, like most MetaEdit+ operations, whereas Align Center and Align Middle work on the geometric center of the elements. With its tidy drawing operations, forced refreshing of the Diagram Editor window is not needed very often. However, refreshing the display is needed when changes made to the conceptual graph by some other editor need to be propagated to the currently open diagram. Similarly, changes made to the underlying metamodel also require forced refreshing. The display can be refreshed by choosing View | Refresh or pressing F5. You can scale an object or relationship symbol by selecting it and dragging any of the selection handles at its corners or the midpoints of its sides. Holding Shift down will maintain the aspect ratio of the symbol. Holding control down will scale the symbol keeping the point opposite the dragged selection handle in the same place. Without control the centre of the object is maintained in the same place, as this best maintains the layout of the diagram – keeping the object on its grid point and keeping role lines at the same angle. Holding down the Alt key will enforce the grid while resizing. To set a particular scale, or scale several elements with the same scale factor, choose Format... from the element’s pop-up menu or from the Format menu (or press Alt+Enter) to open the Format dialog for the selected element(s). The Format dialog consists of two pages, as shown in Figure 4–22 and Figure 4–23. Figure 4–22. 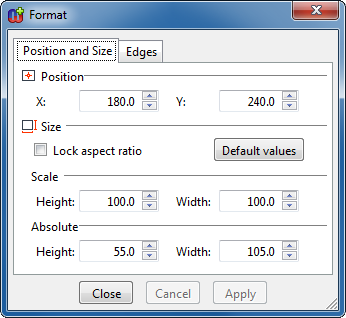 Diagram element format dialog page for position and size. On the Position and Size page (Figure 4–22) you can edit diagram elements’ position and size values. Position is defined as X and Y coordinates from the top-left corner of the drawing area to the target point of the element (generally its center). Size can be defined either as horizontal and vertical scale percentage from symbol’s default size or as absolute height and width in pixels. Checking Lock aspect ratio will ensure that the element will retain its previous geometry while editing its size. The original default size can be restored by pressing the Default values button. Figure 4–23. Diagram element format dialog page for edges. The Edges page (Figure 4–23) shows the position of the left, right, top and bottom edges of the element. Changing any of these will affect the respective edge. Please note that changes in either Position and Size or Edges page will automatically propagate to the other (i.e. changing an edge value will affect both position and size values). The language designer can choose to make some symbols partially or totally non-scalable. The limited scalability is visualized by omitting the nonfunctional handles when the element is selected on the drawing area and by inactivating the respective input fields in the element’s Format dialog. 1) Select the objects to move. Note that Bring to Front will only make this the uppermost object: it will still be below all relationships and roles.